There's always something going on in Moreno Valley. The City offers residents and visitors many recreational and leisure activities, from swimming to golfing to just playing in the park, Moreno Valley has it all. See if there are openings for the Moreno Valley Arts Commission and the Parks, Community Services and Trails Committee. 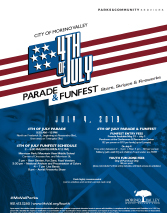 The City of Moreno Valley provides a variety of exciting community events to keep residents entertained throughout the year. These events are listed here and on the community calendar. 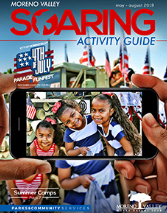 Get ready for this year's Fourth of July Parade and FunFest! You won't want to miss out on the fun of this popular annual event. The new interactive Soaring Activity Guide flipbook allows you to peruse information and register for events. Note: you will need to install the Adobe Flash plugin to view the interactive flipbook. Moreno Valley's city park system has 40 parks and/or joint-use facilities (531.66 maintained acres) and includes a 9-hole executive golf course, 23 multi-use sports fields, 11 tennis courts, nine basketball courts, 28 play apparatus, and three recreation centers. This online map lets you find parks and amenities in your area, as well as checking availability and reserving a park shelter. This is a printable map of City parks and facilities. See a brochure with a map of the multi-use trails in the City. Moreno Valley is also home to the 8,000-acre Lake Perris State Park. This state park has boating, fishing and camping facilities. Box Springs Mountain Park provides trails for hiking and horseback riding. Riverside County’s Box Springs Mountain Park, located off Pigeon Pass Road, encompasses 1,155 acres and provides trails for hiking and horseback riding. The Parks, Recreation and Open Space Comprehensive Master Plan provides guidelines and strategies for the City’s General Plan. It also provides a long-range vision for parks, recreation and open space; matching community needs with parks and recreation services; and identifies potential locations for future neighborhood, community and regional parks and facilities. The Adopt-a-Park or Trail Program was designed to preserve, improve and enhance Moreno Valley parks through community involvement and citizen partnerships. You can play an important role in our success by becoming a volunteer in the Adopt-a-Park or Trail program! The City of Moreno Valley is proud to showcase the work of local artists by displaying art in public facilities. If you are an artist interested in participating in the program, please complete and return Public Art Display Application form. The Cottonwood Golf Center is open seven days a week from 7:30 a.m. to 4:30 p.m., and closed on major holidays. 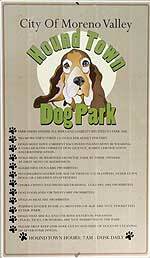 On April 16, 2008, the City opened its first dog park called Hound Town. The park is located at the Moreno Valley Equestrian Center, 11150 Redlands Boulevard, at the southeast level of the Center. The park is a collaborative effort between Canine Friends of Moreno Valley (who solicited donations of materials and labor from businesses), and local Boy Scout groups and the City’s Park Maintenance staff. The one-acre park is divided into two sections; one for large dogs and the other for smaller breeds. Additional features include: a three-in-one drinking fountain for dogs and their owners, two waste stations, a shelter with park benches for sitting, and planters with trees. There is a handicap accessible restroom and parking available on site. This site was recently upgraded with canine training equipment, benches, turf and sprinklers. The park is open from 7:00 a.m. to dusk, seven days a week. So, pack up your canine companions and give them a chance to enjoy the new equipment. Lasselle Sports Park is 12.8 acres. Amenities include: restroom and concession, three turf football fields with natural turf, exercise track, security lighting, picnic facilities, play apparatus for ages 2-5 and 5-12, and parking for approximately 200 vehicles. A Child’s Place Licensed After School Program provides daily homework assistance, arts and crafts, nutritious snacks, and recreation activities for children after school and during school breaks. Location: Armada (334809653), Creekside (334816836), Rainbow Ridge (334803516), Red Maple (334815843), and Sunnymead Elementary (334818292). ASES is an after school program that offers expanded learning opportunities for kids in a safe environment, supporting youth development, and incorporating fun with learning! The City partners with THINK Together and the Moreno Valley and Val Verde School Districts to provide this program. Students engage in fun activities that bolster their knowledge and skills in English, Math, STEM, Arts and healthy youth development. A trained Think Together employee helps students with homework and leads academic, enrichment and physical activities for groups of 20 kids. Students also receive a nutritious snack daily. Time: End of school until at least 6 p.m.
Help your tot get used to going to “school.” Toddlers will learn colors, shapes, letters, and numbers. Activities include games, arts, crafts, and music. Immunization record with current TB test results and birth certificate are required at time of registration. Tots must be potty trained. As a Park Patrol Volunteer, the goal is to enforce park rules, enhance visitor safety, and promote park programs and visitor services offered by the Parks and Community Services Department. Any organized activity or set of activities which involves the possible or necessary provision of additional City services.